It’s always a struggle for automakers to really separate themselves from all the others they compete against. 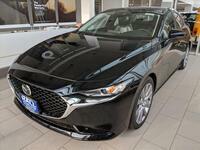 Mazda knows this far to well, having joined the industry when plenty of other automakers had already been established. However, with a little time and fine-tuning, Mazda has now established themselves as one of the few offering luxury-like features at prices that are lower than most other automakers. This combination of quality and comfort/convenience is seen yet again in the 2019 Mazda3. Fresh off its plethora of additions for the 2018 model year, 2019 is more of a carryover. However, that’s not to say the Mazda3 is unchanged. After some fine-tuning adjustments to the engine and the addition of some new safety technology, Mazda made this one even better than before. Check out the 2019 Mazda3 near Milwaukee WI! The Mazda3 has already been renowned for being fun to drive, and now it’s even better in 2019. Under the hood sits the same SKYACTIV®-G engine you’ve come to love in the past in 2.0L and 2.5L sizes. There’s also a newly-available diesel engine option available in the SKYACTIV®-D 1.8L, which is sure to thrill diesel engine fans everywhere. Transmission options will be either a six-speed manual or a six-speed automatic while an all-wheel-drive system is also available. Once you step inside you’ll find some intriguing comfort and convenience features to take note of, starting with the leather-wrapped steering wheel and leather seating with available heating and ventilation, perfect for those cold Wisconsin winters or humid and hot summers. There are some new safety technologies available in the Cruising and Traffic Support System, Driver Monitor System, and Front Cross Traffic Alert. A new 12-speaker Bose® sound system delivers high-quality sound, and you can control what music plays with the Mazda Connect infotainment system. There’s so much more to discover in the 2019 Mazda3, and it will be available here at Hall Mazda in Brookfield before you know it. Contact us today to learn more or schedule a test drive on our website!